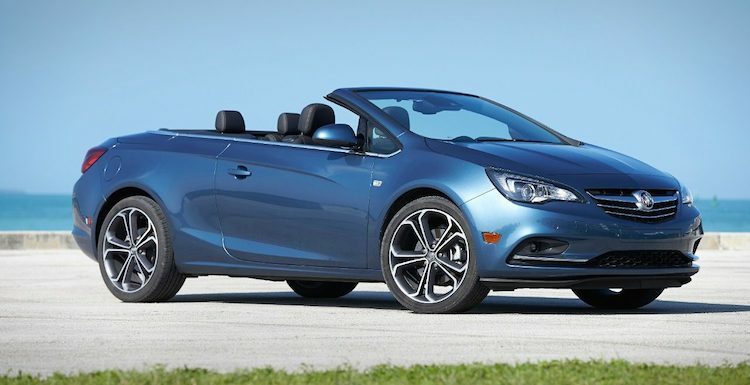 The Buick Cascada is the brand’s first convertible since the Reatta. Almost since its debut in 2016, the Buick Cascada seemed destined for early cancellation. For one, the market for cars, especially convertibles, was especially limited. Further, the Cascada was also the product of Opel, a company now no longer owned by GM, but by Groupe PSA, the maker of Peugeot, Citroen and other Euro-centric brands. The competition was never fierce as few manufacturers participate in the drop-top arena. Early on, the Cascada battled with the now-discontinued Volkswagen Eos, along with the Audi A3 Cabriolet and BMW 2 Series convertible. Some might have thought the Cascada would fill the domestic void left by the Chrysler 200 Convertible, which was last produced in 2014. But its impact was negligible. The Buick Cascada is also sold as the Opel Cascada throughout Europe. GM owned Opel from 1929 to 2017, and occasionally turned to its German subsidiary to supply models for the U.S. market. We’ve seen Opel models sold as Saturns and even the Cadillac Catera utilized an Opel product. Buick has been the main beneficiary all along, especially in recent years as both the Cascada and Regal lines are courtesy of Opel. Despite the end of Opel ownership, GM still relies on its former subsidiary and may continue to do so. The front-wheel-drive Cascada comes with a turbocharged 1.6-liter four-cylinder engine paired with a six-speed automatic transmission. 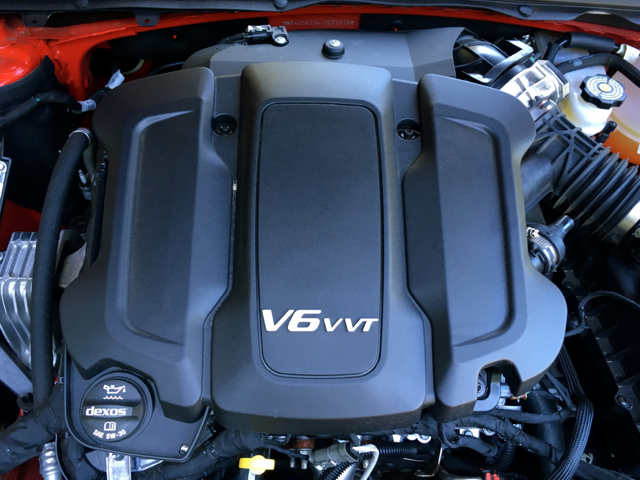 This engine makes 200 horsepower and 207 pound-feet of torque. It is also the only powertrain choice and not a very strong one, given this model’s two-ton weight. It earns 21 mpg in the city and 29 mpg on the highway, which isn’t especially inspiring given this vehicle’s size. 3. Mainstream, Premium or Luxury? GM doesn’t call Buick its intermediate brand, although in many ways it is. Chevrolet and Cadillac serve as the bookends for GM, while Buick (and GMC) occupy the middle ground. The Cascada’s handsome exterior and quiet cabin with the roof up are two of its strong suits as well as its long list of standard features. But the cabin seems cluttered, sits just four people, and this Buick lacks certain advanced driver-assist features, including automatic emergency braking. 4. One of three Buick car models. Take a look at Buick and you’ll find Encore, Envision, and Enclave crossover utility vehicles. Together, these three models comprise more than two-thirds of the brand’s sales. That leaves three Buick car models to fill out the product line. Besides the Cascada and Regal, Buick sells the large LaCrosse sedan, and that model will come to an end before 2019 closes. Sales fell by nearly 23 percent last year, with just over 15,000 units sold. Sales increased by about 22 percent in 2018 as Buick rolled out new designs. Interestingly, the Regal is also supplied by Opel, but will likely live on. Currently, Buick offers this midsize model in sportback and wagon versions, the latter similar to the crossover designs that have captured consumer interest. 5. Tepid sales, at best. In 2018, Buick sold just 4,628 Cascada units, down from 5,595 a year earlier. In its first year, Cascada sales tallied 7,153 units. The sales drop isn’t surprising as it follows a consumer-wide trend away from car models. 6. Opel cancels the Cascada. GM may be canceling the Cascada, but it starts with Opel, which markets the model under the same name. Opel builds the Cascada at a factory in Poland and says that it is ending production there in response to slow and declining sales. Thus, the Cascada cancellation is ultimately a PSA Groupe decision, not GM. Still, this gives GM an easy “out” as they depart the segment. With the Opel connection shrinking, where will Buick turn for future models? Likely, they’ll continue to offer their share of GM-derived models that they share with Chevrolet and GMC. But, they have another source that already supplies the Envision: its China operation. A cursory look at the brand’s China lineup shows hatchbacks, sedans, and crossovers, along with vans. Should Buick need additional product going forward, it may tap its China operation to supply the same. Of course, tariffs and geopolitical tensions may have some say in limiting that. New Sportback model offers an interesting take on a hatchback design. This sport red paint scheme is standard with the 2018 Regal GS. Other colors are available for an extra cost. We have a new Buick Regal to consider, but it probably isn’t the model you think it is. Indeed, for 2018 the Regal offers two body styles — a wagon and a hatchback — replacing the previous sedan. As before, the Regal is a midsize model with some upscale features. Before we examine the model at hand, let’s take a look at the Regal name, which has been used by Buick since 1973, although it had disappeared for a while earlier this millennium. During the years it was absent in North America, the Regal continued in China. Beginning in 2010, the Buick Regal made its North American return, thanks to Opel and the Insignia sedan on which it was based. That model was built in Germany for its first year, then in Canada until the fifth-generation Regal came to an end in 2017. Starting in 2018, an all-new Regal rolled out. The sedan is gone as well as the Canadian production that previously supported it. For the latest model, Buick turned to Opel and its factory in Germany to supply two new body styles: a wagon (which we covered here) and a four-door hatchback or Sportback model. That latter model is offered as the Regal Sportback or Regal GS. I had the GS, which is a name that represents the performance model in the Regal line. Happily, the 2018 Regal GS lives up to the previous model, while striking out in a new design direction. We’ll drill down on the new vehicle’s particulars, including the changes for this new sixth-generation model. The GS’ profile gives only the slightest hint that this sedan is actually a hatchback. Buick markets the GS separately from the Sportback, although it essentially serves as the top-tier trim for that body style. What is especially noteworthy about the GS is that instead of offering the 2.0-liter turbocharged four-cylinder engine in the Sportback and TourX wagon, the Regal GS gets GM’s 3.6-liter V6 engine. That engine powers the full-size LaCrosse sedan and the Enclave crossover. GM pairs this engine with a 9-speed automatic transmission. The GS is all-wheel drive. 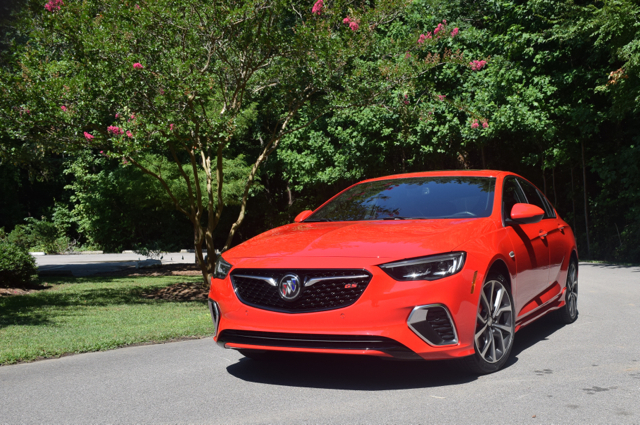 The 2018 Buick Regal GS starts at $39,990, inclusive of the delivery charge. Buick calls this model a “sport sedan” and at first glance it does have sedan-like proportions. That is, until you stand behind it and take note of the large glass window that slopes down to the notch-like rear. Kudos to the designers as this model looks nothing like the hatchbacks of yore. It also doesn’t look like any Buick we’ve seen before. And that is a good thing. 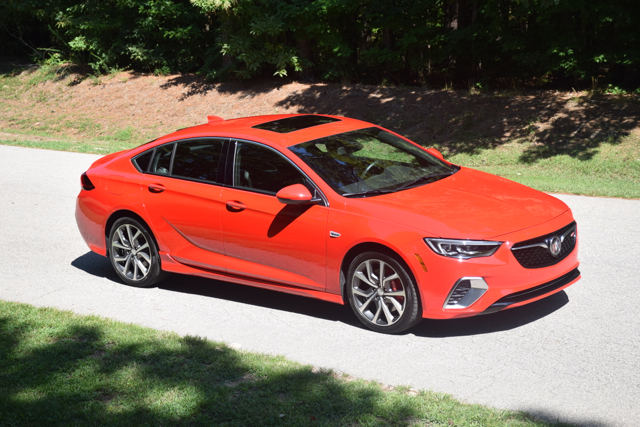 Evidently, Buick wants the new Regal to do for the model line in the new millennium, what it did in the 1980s — supply a handsome look with performance attributes. The first indication the GS is a hatchback is with its large rear glass window. The front fascia commands attention with its sleek headlamps and bold overall presence. Its intake is narrow and long, placing an aggressive stamp on its face. The GS’ profile is handsome too — you won’t find ornamental vent ports, but you will see functioning side marker lights. The appropriately placed character lines and body sculpting add flair. The rear deck opens by pressing the Buick insignia. The liftgate lifts high, revealing a gaping storage compartment. If you never thought you’d consider a hatchback, the GS’ design invites you to take a closer look. If there is a change I would like to see is for the key fob to include an unlocking mechanism. There isn’t one and I couldn’t find a button inside for that either. The GS’ cabin is roomy, comfortable, but it is also a contradiction of sorts. Its strongest attributes are its sporty front seats, which have heating, cooling and massaging features. 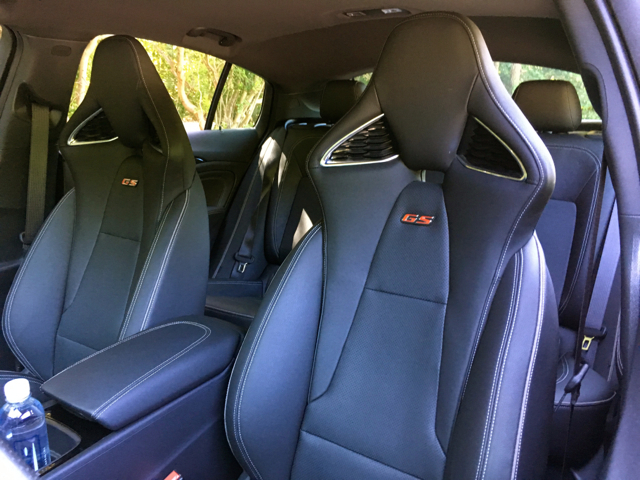 They’re not Recaro seats, but they do supply superior neck, back, hip and thigh support over standard bucket seats. The 40/20/40 split-folding rear seat folds completely flat. When the full seat is down, the already generous storage capacity expands from 31.5 cubic feet to 60.7 cubic feet. It is this storage attribute that made hatchbacks appealing in the first place. In the Regal GS, the space seems incredibly large — you’ll have no trouble fitting a bicycle or other sporting gear inside. The rear seat headroom is sufficient, at least I found it was that way with my six-foot frame. As for the interior layout, it features many more hard plastics and big buttons than we like. Where the exterior hits all the styling highlights, the cabin falls short — it could be so much better than it is. I recently drove the Kia Cadenza GT and was impressed by its upscale feel, something that’s missing in the Buick. The Kia costs less money too. The standards feature list includes full power accessories, a tilt-and-telescopic steering column, leather seats and dual-zone climate control. The pedals are bright, but they’re not fully metallic. The GS’ front sport seats enhance align with this model’s mission. I’ve given Buick ample plaudits in the past for its in-cabin technologies and that praise continues with the new model. It begins with an OnStar plan featuring a three-month trial subscription. It continues with a 4G LTE Wi-Fi hotspot, a feature that has bailed me out more than once when I was in a remote location and needed Internet access. Other features include an audio system with an 8-inch color touch-screen display, Bluetooth, Android Auto and Apple CarPlay compatibility, USB ports and satellite radio. Optional features include an 8-speaker Bose audio system, HD Radio and navigation. Beyond OnStar, stability and traction control, and a rearview camera, the GS offers several driver-assist technologies. The standard package includes lane change alert with side blind zone alert and rear cross-traffic alert. You can also upgrade by choosing a Driver Confidence Package ($1,690). This package brings in such features as adaptive cruise control, following distance indicator, forward collision alert and forward automatic braking. It also has lane keep assist with lane departure warning, front pedestrian braking and a head-up display. The previous Regal GS utilized a turbocharged four-cylinder engine. However, this time it has a naturally aspirated 3.6-liter V6 engine, which makes 310 horsepower and 282 pound-feet of torque. Buick pairs this engine with a nine-speed automatic transmission and includes standard all-wheel drive with active dual clutch. This is the first time in more than a decade that a midsize Buick model has a V6 engine. It is a very good match for the Regal GS, as it delivers ample step-off acceleration and robust mid-range power when you need it. The only disappointment is the lack of paddle shifters, but at least the transmission moves quickly between gears. And if you must, you can move the shift lever to manual mode and control gear shifts that way. Metal pedals and a thickly padded steering wheel are a GS feature. What helps this model shine is its sophisticated all-wheel-drive system. The system shifts power to the rear wheels when needed, then to the individual wheels on demand. This arrangement enables the Regal GS to hang twisty roads and pull out of corners with ease. Combine all this with weighted steering and a constantly adjusting suspension system and the GS has our attention. One of the more curious arrangements is this Buick’s drive mode system. Instead of utilizing a dial to switch between normal, sport and GS modes, you’ll find switches at the base of the center console just ahead of the transmission stick. Normal is the default mode, so you don’t do need to do anything there. When I pressed either of the switches, I expected noticeable changes in engine mapping, steering weight and exhaust sound, but it was hard to detect the changes. So, although I liked the powertrain arrangement, the lack of paddle shifters and the hard-to-perceive drive mode changes are disappointments. The GS is the lone Regal model powered by a V6 engine. Buick prices the Regal Sportback from $25,915, offering four trims below the GS. In fact, the well-equipped Essence trim matches most of the GS’ attributes and costs $5,200 less. This means you get a 2.0-liter turbocharged four-cylinder engine with 250 horsepower and 265 pound-feet of torque matched with an eight-speed automatic transmission. You also get all-wheel drive. 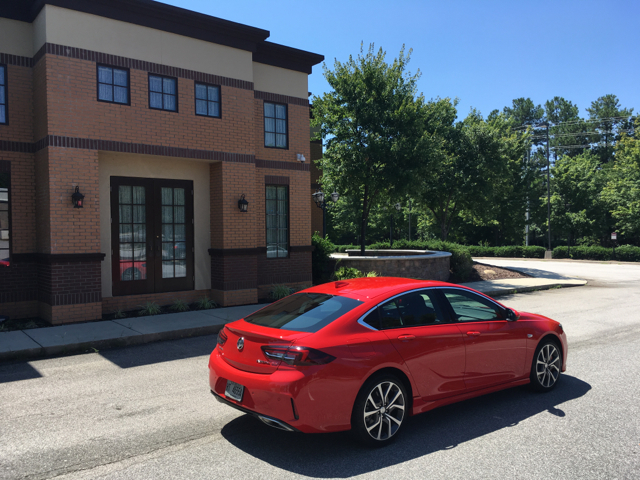 All things considered, the 2018 Buick Regal GS delivers an outstanding exterior design, leading-edge technologies and decent performance. However, its interior trails the competition, including the Kia Stinger and the Audi A5 Sportback. 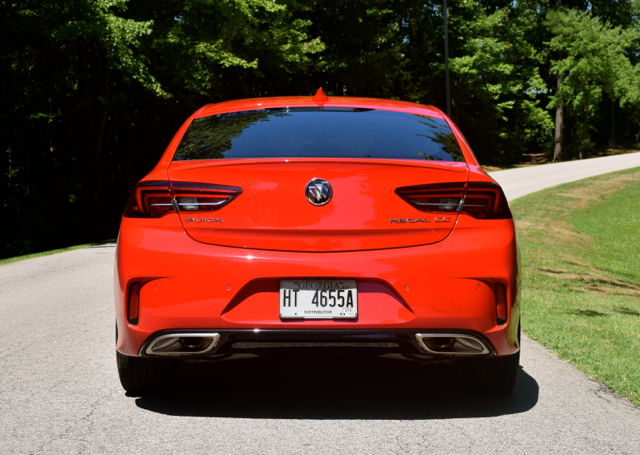 2018 Buick Regal GS photos copyright Auto Trends Magazine. All rights reserved.